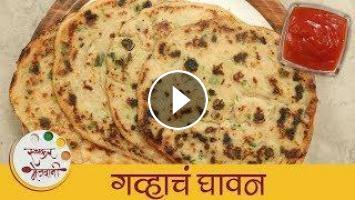 Learn how to make Quick breakfast recipe Gavhache Ghavan at home with Chef Archana on Ruchkar Mejwani. Gavhache Ghavan - गव्हाचे घावन is a traditional Maharashtrian dish which can be had as a meal or a snack. Chef Archana uses a delicious batter full of veggies like tomatoes and onions infused with spices which are fried for a delicious serving of Gavhache Ghavan. Try our Quick breakfast recipe Gavhache Ghavan and do let us know your experience in the comments section below. In a bowl add wheat flour, Semolina, Onion, Green chillies, Ginger-Garlic Paste, Spring Onions (chopped) & Salt to taste and then add water as required and mix them all properly. Heat a pan, spread oil on it and add a ladle full of batter on it. Let it fry on both sides evenly with the lid over it. Like this, you can make the remaining ones. Now, your Gavhache Ghavan is ready to eat while it is hot.